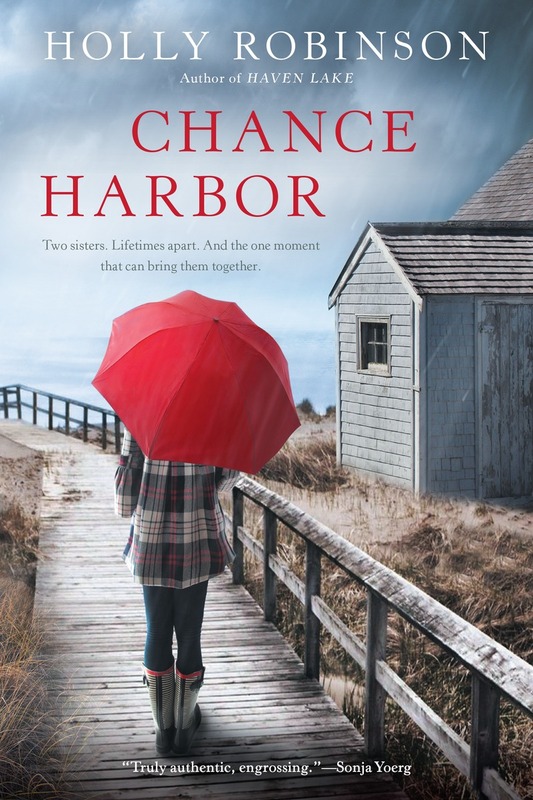 I’m a sucker for an enticing family drama so I was thrilled at the release last month of Holly Robinson’s fifth novel, CHANCE HARBOR. Her novel is based on the true story of a young girl abandoned at a bus station by her mother, who everyone fears dead. The book is set partly on Prince Edward Island, where Holly’s summer home is one of her favorite places to write. Holly’s writing is beautifully lyrical, yet never weighs down the drama of the story, which is filled with secrets and twists and heartfelt emotion. We’re excited to welcome Holly on The Ball today so we get to know the person behind the writing. And don’t forget to leave a comment at the end to win a copy of CHANCE HARBOR. Anywhere outside, no matter what the weather. I even write outside when I can, on a screen porch my husband and I built onto the side of our barn. I find that being outside—hiking, walking the dog, gardening—really helps me think, especially when I’m stuck on a thorny plot or struggling with a character. Besides my porch, I love to write in our house on Prince Edward Island, where much of my new novel, CHANCE HARBOR, is set. On the island, there is open sky and farmland everywhere, and nearly every red clay road leads to a secret beach. The road to publication is twisty at best. Tell us about some of your twists. My road to publication wasn’t just twisty. It was filled with potholes and subject to drone attacks. I started out as a biology major, intent on going to medical school, but had to take an elective my senior year. I chose to take creative writing and my goose was cooked. I told my parents I was going to put off becoming a doctor and give my writing one year—a whole year, mind you!—and, if I didn’t become published and famous in that amount of time, I would be sensible and go to medical school. Ha!! It took me 25 years to publish my first novel. Between the time I started writing fiction and publishing it, I discovered that nonfiction was easier to sell, thank goodness, so I started writing freelance pieces for magazines and newspapers. That led to a career as a ghost writer, essayist, and columnist—and, finally, a novelist. I have written in many genres: crime fiction, nonfiction, paranormal fiction, romance, erotica, you name it. The thing I’ve discovered is that it’s very difficult to write books you wouldn’t necessarily pick up and be excited about reading. For that reason, I’m absolutely no good at writing romances, paranormal stories, and erotica, since I never read books in those genres. However, I do love to read nonfiction, so I’ve ended up publishing a memoir of my own as well as many ghostwritten memoirs for celebrities—I love doing those! Living other lives. So far in my novels, I’ve been a sheep farmer, a potter with a house on the beach, a tough nurse practitioner, an educational advocate for kids, a competitive horsewoman, and an ace knitter and gardener. I like to pick topics that require research so that I have an excuse to read about new subjects. Oh, and one other huge perk: I get to work in flannel pants and slippers. My mother has always been my first reader. She is the one who inspired me to read when I was young, because her favorite thing to do was read. She introduced me to our local library and never, ever tried to censor the sorts of books I read. I was working my way through some serious literature, science fiction, crime novels and romances by the time I was in middle school—all great training for a writer. As a reader, my mother has a keen eye and a great sense of pacing, and is always, always honest, even when I sometimes wish she’d let me down a little more easily. I appreciate her editorial vision. GIVEAWAY: Comment on this post by noon (EST) on Friday, November 13th, to win a copy of CHANCE HARBOR (U.S. only). Follow The Debutante Ball on Facebook and Twitter for extra entries—just mention that you did so in your comments. We’ll choose and contact the winner on Friday. Good luck! 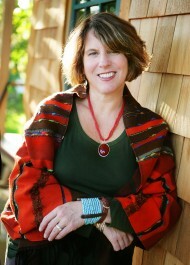 Novelist, journalist and celebrity ghost writer Holly Robinson is the author of several books, including THE GERBIL FARMER’S DAUGHTER: A MEMOIR and the novels THE WISHING HILL, BEACH PLUM ISLAND, and HAVEN LAKE. Her new novel, CHANCE HARBOR, was published in October 2016. Holly’s articles and essays appear frequently in publications such as Cognoscenti, The Huffington Post, More, Parents, Redbook, and dozens of other newspapers and magazines. She and her husband have five children and a stubborn Pekingese. They divide their time between Massachusetts and Prince Edward Island, and are crazy enough to be fixing up old houses one shingle at a time in both places. Connect with Holly on her website and on Twitter. Who wouldn’t want to work in flannel and slippers! Ah! Book looks great. I follow The Debutante Ball on Facebook and Twitter. Yes, Rhonda, I’d never be a writer without my Mom cheering me on! This sounds like a great book. Thanks for the chance to win. Great story in a beautiful setting! New England has become my favorite book-setting, especially after visiting for the first time in early fall. I follow The Debutante Ball on both FB and Twitter! It’s definitely a great site to follow, Susan! I hope you get a chance to enjoy Chance Harbor! I got my copy last week and I’ll read it soon! Holly, thinking of you loving to be outside, writing on your screened porch or near the beach…my favorite place to be is walking along the shoreline while the sun is dazzling the water like diamonds…I am lucky to live a minute away from this. Your book Chance Harbor sounds like a great book, full of secrets and wonder. I follow The Debutante Ball on FB, and Twitter also. Ahhh, how lucky we are, Carol, to have these wonders so close! I have really appreciated DebBall blog-this is my first year following it! I also like these guest authors…and am keen to read Holly Robinson! For that, I will follow you!